Some people have leather couches. Some have fabric couches. Some people don’t even like couches, but prefer lounge chairs or recliners. The point here is that we all have our preferences. And the thing is—pets aren’t that different. They have preferences over things in their lives too. One of the things they have preferences over is the toys they enjoy playing with. Some pets like plush toys. Some pets like hard durable chew toys. Knowing what toys are safe for your pet AND knowing your pet’s preferences is key to success in finding the perfect toy for your pet. Fortunately for our furry kids, pet stores have aisles and aisles FILLED with toys designed specifically for their mental, physical, instinctual, and emotional needs and desires. Toys come in all shapes, sizes, colors, designs, textures, functions, etc. Here are just some of the basics. Plush toys are typically soft toys filled with some sort of stuffing. They often have squeakers. These toys can be great for dogs that need a softer toy. A lot of dogs like to carry these toys around or squeak the squeakers. Some dogs find it enjoyable to “kill” the squeaker (an instinctual behavior) as quickly as possible. Premier carries LOTS of plush toys, including those in our Sheepskin and Wild Thangs toy line. Rubber toys are a popular kind of chew toy. Strong durable rubber gives the dog an opportunity to chew on something appropriate. Rubber toys also come in a variety of shapes, sizes, and colors. Many rubber toys have treat dispensers in them, have the ability to be filled with a soft filling (i.e. peanut butter), or are just rubber alone. We offer several rubber toys which can be played with alone, with the treat meters, or filled with a soft filling. Hard plastic food dispenser toys give a pet the opportunity to work for their food. 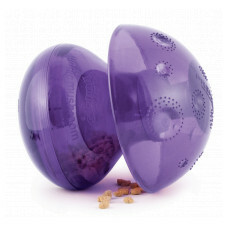 The hard plastic toy holds treats or kibble and the pet must work and manipulate the toy to get the food out. This really gets the pet’s brain working, as the toy requires the pet to figure out how to get the food out. The great part about most of these toys is that there are lots of ways to get out the food. Some pets manipulate the toys by pushing it with their nose or paws, while others pick them up in their mouth and throw them. Regardless of which method they choose, it makes the pet work for their food! Nylon toys are among the most durable toys. They are made of a hard nylon and dogs often enjoy chewing on them. Some nylon toys also come with treats for the dogs to chew off. These toys give your dog the opportunity to chew on something appropriate. Although these are some of the basics, there are many many more different types of toys. Even if you know exactly what your pet likes, it’s of the upmost importance to assess the safety of the toy for your pet. Even if you know your dog will LOVE the plush toy with a long rope, it is not the best choice if you know that your dog will then consume the rope causing potential health problems. And even if your dog loves to chew things, a hard nylon bone might not be the best if your dog has weak young puppy teeth or senior teeth. Make sure you are assessing the toy BEFORE you give it to your pet. What is your pet likely to chew off of the toy and potentially consume? How long will the toy last with your pet’s play habits? And as always, here is the very very important plug for supervision. Supervise, supervise, supervise. Supervising your pets with their toys is the easiest way to make sure your pet is safely and appropriately playing with the toy. Remove chewed off parts of the toy so that your pet cannot consume them. If your pet is going “crazy” with the toy and chewing parts of quickly, consider removing the toy from them and giving it back to them later when they are a little calmer. Always supervise and take action when needed. A short but very important sidenote: If your pet has consumed any part of a toy or is experiencing any sort of health reaction from playing with a toy, we recommended that you consult a veterinarian immediately. 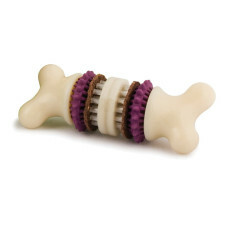 Once you’ve chosen a safe toy that you know your dog will like, it’s play time! What Is Your Vacation Missing? What Toy Is Right for Your Pet?